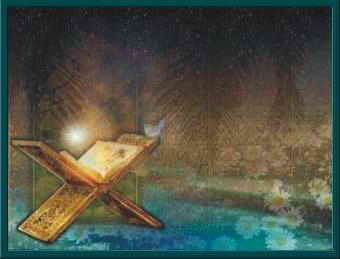 RAMADAN is the time of year in which we engage in a month-long process of introspection, repentance, and self-renewal. It is not only a time when we are to increase our commitment to performing various acts of worship such as fasting and prayer, but it should also be a time for reevaluating all aspects of our lives. As Muslims men, this process should include room for assessing our performance as both husbands and fathers. For most people around the world, these are indeed strange and trying times. For Muslims, not much else needs to be said along these lines. Perhaps it is only knowing that this world is the realm of testing and that in one way or another in our lifetimes we will all be tested, that allows us to get up every day and face the outside world. For many family men, however, rigor and severity are not a reality only on the outside, but inside the home as well. For such individuals and their families, the abode of peace that the home is supposed to be is anything but that and many such families are living quiet lives of sadness, desperation, and rancor due to family relationships that are simply not working. Prophet Muhammad (peace be upon him) in a very well-known Hadith was recorded as saying that marriage was equal to half of the deen [of Islam]. This profound statement by our master has spurred volumes of scholarly commentary over the centuries and from a layman s perspective, the Hadith is monumental in its meaning and importance for those who have embraced the way of marriage and family. Only through deep reflection on our lives as husbands and fathers can we begin to understand the essence of the Messenger s (peace be upon him) words and why marriage is awarded the weight of half of our faith as Muslims. The life partnership and commitment that marriage entail should be approached as a spiritual undertaking that can be an important facilitator of individual spiritual development. Just as we are essentially spiritual beings in a human existence, marriage is a journey that if approached as such can be a rich source of learning and personal development for both spouses. As Muslim men, much of what we are taught about family life pertains to our roles and responsibilities as husbands, i.e. the X s and O s of marriage and family life.However, too often the spirit of marriage is ignored or missed. Too often, in the course of trying to manage our families, we completely overlook the nuances that make marriage and family so important a human experience. Often we overlook the patience, sacrifice, compromise, love, understanding, humility, strength, and so many other inputs that are needed to be a good husband and father. These are the fruits of the dedication and hard work that go into family life that help us to develop into better and more universal human beings. Though certainly there is no magic formula for achieving a successful marriage and family life, selflessness, love, and service are a few key principles from the teachings of our tradition that, when applied, can have remarkable transformational qualities on our roles as husbands and fathers and subsequently, our families in general. One of the most important themes in the life of Prophet Muhammad (peace be upon him) is the notion of meeting the needs and fulfilling the rights of others without any expectation of reciprocity. It is well-known that the Messenger of Allah (peace be upon him) actively participated in household duties such as sewing, cooking, serving his guests and cleaning. The modern world often teaches us to expect reward for our work, time and efforts. Even as Muslims, it often seems as though we take these same expectations into our home lives. It is common to hear about Muslim husbands and fathers demanding to be treated like kings in their homes with their wives and children expected to act like servants rather than loved ones. This phenomenon, despite going against the spirit of love and service that the Messenger of Allah (peace be upon him) brought to the world, has many negative effects on families. For one, the distant father syndrome prevents children from fulfilling their divine role as a source of love and inspiration to their parents. As is commonly understood from the famous Hadith that all children are born in a state of Islam. Our scholars have told us that the greater meaning of this Hadith is that children come into this world pure and it is only what they learn from their parents and societies ( i.e. the world) that turn them away from this pure state. This purity of heart means that they are essentially beacons of mercy and love, a reminder of the endless blessings of the All-Merciful. However, the distant father, the one who would be king in his own home and God-knows-what outside of it, himself a product of rejection, is not open to this divine blessing sent in the form of his children. The child, in turn, learns rejection early on and internalizes it, eventually manifesting his frustration in a multitude of ways including acting out, rebelliousness, mental illness, oppression, or simply the inability to open up to others the feeling of separation that typically goes hand in hand with illnesses such as depression and severe anxiety.